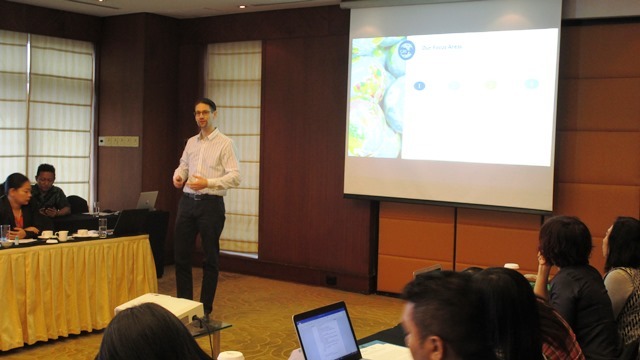 IBCSD together with GRI was holding a workshop regarding Sustainability Report on February 8th, 2018. The workshop went smoothly with a very high engagement of discussion within the participants. In promoting Sustainable Development in Indonesia, IBCSD encourages business sectors to be transparent by issuing Sustainability Reports that would highlight not only the efforts they undertake to adopt sustainable business practices but also map out their existing sustainability impacts. Sustainability Report has become a requirement for financial service, listed and public companies in Indonesia based on the Regulation of Financial Services Authority No. 51/Pojk.03/2017 on Application of Sustainable Finance to Financial Services Institution, Issuer and Publicly Listed Companies. Mandatory for issuing Sustainability Report that will effectively be applied in 2019 and after, shall be made for the period of 2018. It will be easier for a company to follow the regulation if the various components in the supply chain start systematically collecting and reporting on their sustainability impacts Report as well. Moreover, in the future, the regulation will possibly be extended and applied for non-listed companies as has been the case for example in the EU. IBCSD in collaboration with Global Reporting Initiative (GRI) are engaged on Corporate Sustainability Management and Reporting for Competitive Business Program (CSRCB), a global training program helping large companies increase the transparency in their value chain while enhancing their ability to report on their own sustainability impacts and measures. Many companies from varies sector came and actively engaged in the fruitful discussion. OJK, IDX, and other stakeholders were there too sharing their perspective and knowledge. IBCSD and GRI will not stop here and going to continue with many more projects onward. For Indonesian based companies, whether it is IBCSD’s members or not, IBCSD will always be delighted to be contacted regarding this program.